If your business had a viable means to enjoy a greater financial upside, it would be an endeavor worth considering, right? It’s surprising, then, how many business leaders hastily dismiss the idea of expanding overseas. Many perceive the pursuit to be too daunting, too complex. But in reality, international expansion could very well be your ticket to greater revenue and incremental profits — particularly if your business has shed its start-up status to become an established, revenue-generating entity. Based on the many years I’ve spent helping businesses grow beyond U.S. borders, there’s good news: it’s not as daunting – or as costly — as you might think. And ruling out the notion altogether means you could actually be leaving money on the table. In this blog, I’ll discuss how, with the right planning and foresight, you can lay the groundwork for successful expansion. Where you go will obviously vary depending on the products or services you sell and the industry you’re in. Generally speaking, many organizations choose Western Europe (in particular, the United Kingdom) as their first point for expansion. This eliminates many barriers due to the common language, similar rules of law, and large market with like demand. It’s after acquiring a foothold in the U.K. that those companies will evaluate further expansion into Western Europe and/or Asia. During this phase, thorough market research will ultimately determine your path, including whether or not it makes sense to open individual regional offices. Companies that have locations and employees in Germany and France, for instance, have a considerable advantage as consumers in those countries are more inclined to buy from local companies versus one located elsewhere. After deciding where to go, there are a number of “chores” required from your company in order to conduct business in foreign markets. These can be divided into three main steps: the initial creation of your foreign entity, the selection of a regional bank, and the appointment of key resources. Advise your business on the necessary paperwork that needs to be filed to incorporate; then prepare that paperwork on your behalf. Open up legal entities for you anywhere in the world, helping to ensure that, as time goes on, all your necessary legal paper work is filed each year. Provide other services that you may desire including services for payroll, accounting, and tax filings. Do you anticipate future expansions? 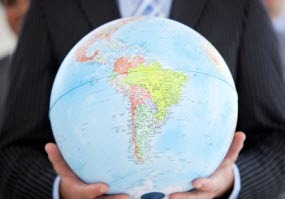 If so, it’s best to consider a company that operates in several different countries versus specific regions. Do they provide additional services (including the ones mentioned above)? It’s best to analyze upfront the types of services you are looking for — then compare the costs of those services across a few different options. What are the costs and fees? Inquire about the one-time setup fee for incorporating your business in the desired country. Also inquire about the ongoing annual maintenance fee that will be required to keep you in compliance with annual filing laws and other required paperwork. Do you have banking operations in the country/countries that are being targeted for expansion? Do you offer bank accounts in foreign currencies and allow foreign wire transaction processing? What are the fees associated with international transactions (for example, converting currencies or processing transactions)? A few caveats to keep in mind… Many local U.S. banks lay claim to having services or partner banks in foreign countries. While this may be true, it’s always best to perform additional due diligence to ensure that those capabilities truly meet your standards. Some companies will cite feeling that those capabilities were overstated to them — and they end up switching to larger global banks. It’s also smart to look for global banks with regional branches that serve as your U.S. home base, making it easier and more accessible to conduct business in markets that you’re not physically in. When considering which audit and tax firm to use, be sure you negotiate based on capabilities and fees. Try to consolidate. Typically, one firm will provide your audit, tax, and filing services. Ideally that will be the same firm as your U.S. firm, as the cost of employing two firms (one U.S. and one foreign) is too costly and inefficient. Ensure the tax firm will help you with VAT tax and other local tax calculations (depending upon what country you are incorporated in) and that they’ll keep the necessary paperwork and files as needed on your behalf. Consider using your corporate secretarial services company. Many of them will provide these same services, so weigh your options to see if that makes sense for you. Personally, I have found that a good audit and tax firm is usually the best choice. Find a reputable employment firm and labor attorney. To find employees, I would suggest leveraging a local employment agency to help recruit and identify the best-fit talent for your foreign office. Not sure where to start? Identify recruiting firms that cater specifically to U.S. businesses expanding overseas, then narrow it down with some simple online research. Ultimately, you want a reputable firm with a long track record and positive reviews from businesses in the same industry as yours. Many of the secretarial and audit/tax firms can provide you with good leads on local recruiting firms. Also ask your audit/tax firm for recommendations on a good labor lawyer. Every foreign market has different employment laws — for example, some countries such as England have mandatory pension withholdings and filing requirements. A local labor attorney can be a valuable resource in helping you navigate those local laws and requirements. With the right partnerships and proper support, the idea of international expansion will start to take shape — and before too long, you can start reaping the benefits of overseas expansion. Keep in mind, 8020 Consulting is here to help you along. From helping you strategize which geographic markets to pursue, to bridging relationships with service providers, to project managing details large and small, 8020 Consulting has the capabilities and global expertise to guide you through each of these steps and handle any challenges that arise. John is a CPA with strong international management experience. He has spent time in the UK, Germany, India, and the Middle East, and has established numerous contacts in the banking and financial service industries. John has the well-honed ability to grow a company from early stage to maturity in both US and global markets. He has managed global operations teams including the formation and expansion of India offshore operations the expansion of company into European market.